There are many sides to Andrew Carmellini—there’s the Cleveland-bred, all-American boy who chicken-fried quail at comfort-food clubhouse the Dutch, and the globe-trotting gastronome who pulled from French foothills past traveled for his bistro blockbuster Lafayette. But Italian cuisine has always been the restaurateur-chef’s sweet spot, cultivated as a 14-year-old boiling pasta at the local Italian joint back in Ohio, an itch he scratched with the rustic plates at A Voce and Locanda Verde. 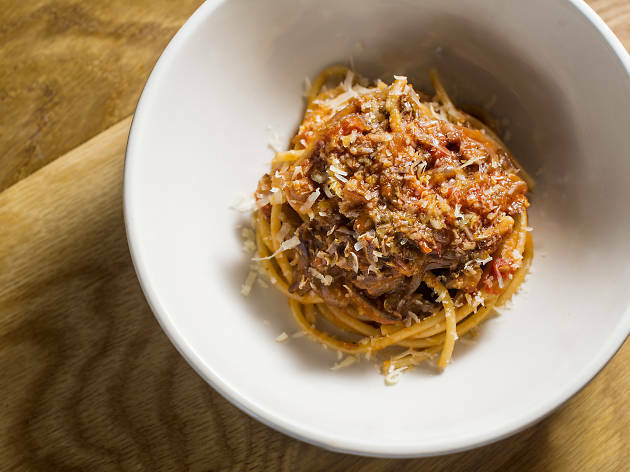 Carmellini’s latest venture, a two-story pasta emporium in the former Peels space, was trademarked seven years ago, but the project was put on pause when the hype-storm that was Locanda debuted—and the wait may just be a saving grace. 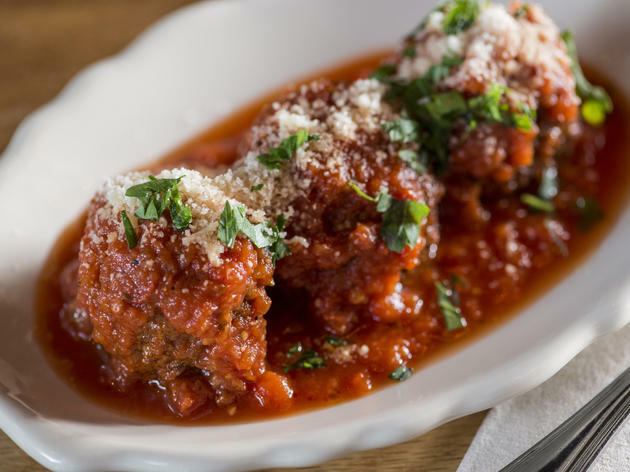 In the years between, Gotham’s Italian eating has become a parade of oversize gimmickry, all wingspan menus, pizza-size parmigiana and booming Sinatra. 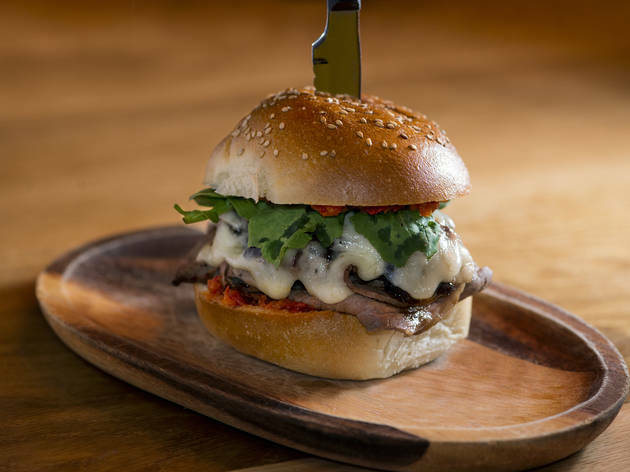 Instead of jumping on the bigger-is-better bandwagon, Carmellini, along with fellow chef Sal Lamboglia, doesn’t just go small—he goes primi. 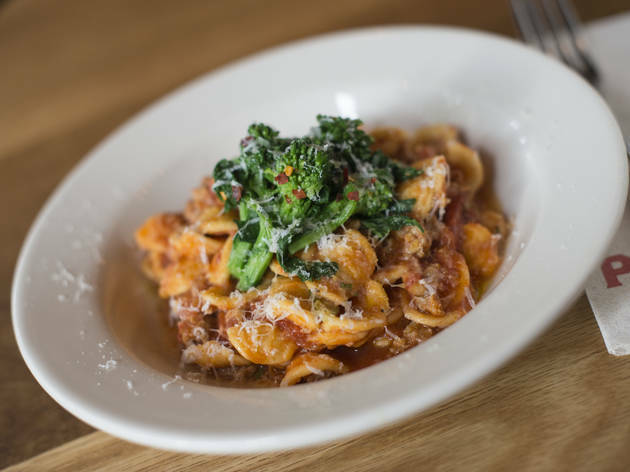 Piccolini, antipasti and house-made pastas (ruffled-bell campanelle, half-moon mezzaluna) all share menu real estate, with one notable exclusion: entrées. 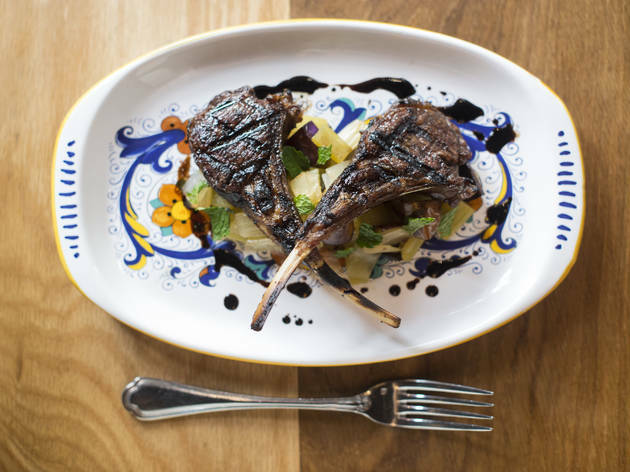 Meaty mains are regulated to nightly specials only, like the succulent Thursday night lamb chops ($29), instead spotlighting that feast-starting first act, primi piatti. And rightly so. 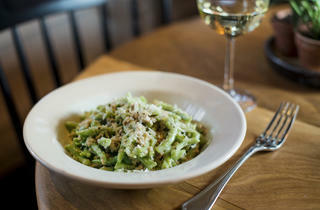 Fork prongs battle over shared bowls of tender orecchiette ($16), turned creamy from the welcome addition of chickpeas to broccoli rabe and fennely sausage, and country-green spinach cavatelli ($17), a wine-rich veal bianco sauce clinging lustily to the pasta’s seal. A tangle of linguine ($14), sucker-punched with heady four-clove garlic and finished with crispy bread crumbs, is so heart-stoppingly good that if someone doesn’t want to snog you after, reconsider the relationship. 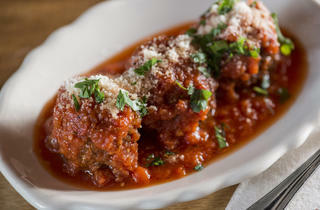 Smaller plates are more hit-or-miss—though cloaked in a tangy, toothsome sugo, the fontina-stuffed meatballs ($12) suffer from a devastatingly watery center—but are vital to fill out the entrée-less spread; plus ordering a cavalcade of dishes puts a smile on your flanneled server’s face to rival your are-you-sure-you’re-not-hungry nonna. 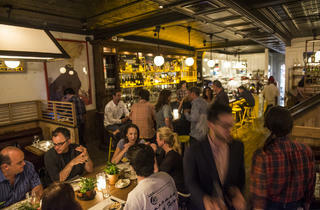 Those plaid shirts are no accident: Waitstaff, dressed like L-train lieutenants, bustle around a space that owes as much to south Brooklyn as it does southern Italy, with communal tables screaming both farmhouse-chic and family-style. 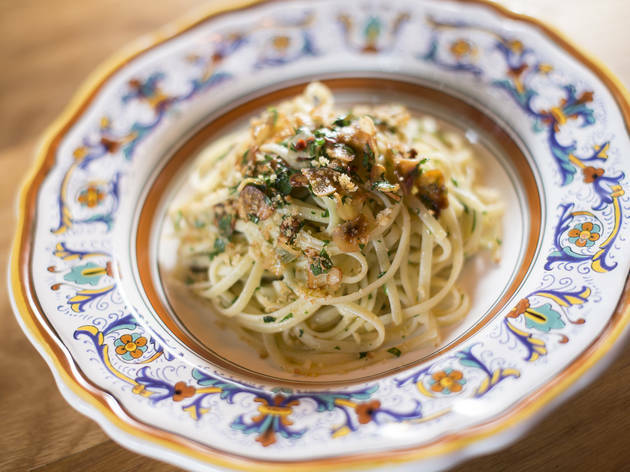 With its off-duty PR-girl clientele, the pasta shop dips a toe in splashy Italian, but Carmellini’s smart enough not to wade into the deep end. I was a bit skeptical on Bar Primi since I heard the dishes here were a drastic hit or miss, but I had a very positive experience! The rice balls lived up to the hype and the brussel sprouts with bits of crunchy pepperoni were incredible. I wasn't a fan of the frose - it was a very small amount and quite bitter. For my meal, I went outside my comfort zone and got the squid ink campanelle with crab and garlic crema. It was absolutely delicious and had a kick to it that really elevated the dish for me. Bar Primi is awesome - the menu has options for everyone and the frose is really strong - although not necessarily "frozen" like a slushy. 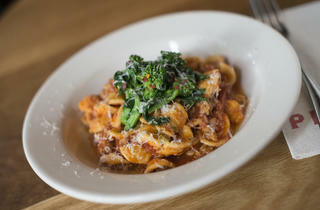 You really can't go wrong with anything here - pastas, pancakes, its all amazing. There's also a whole upstairs area which is really nice and feels less like the "bar" vibe downstairs. 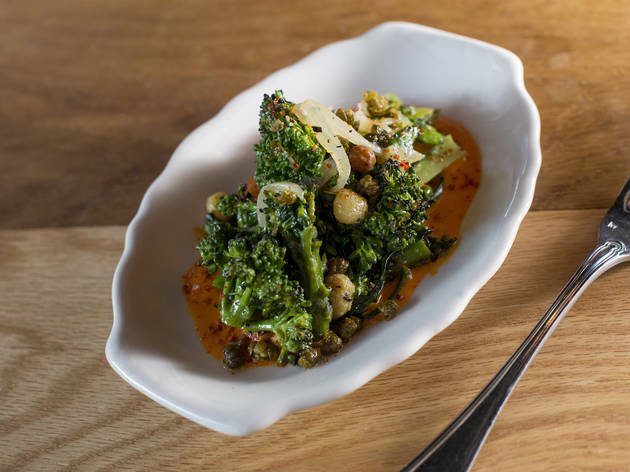 I've gone to Bar Primi twice (I normally try to get to different restaurants instead of going back to the same), but it's worth the repeat, and I plan to return again. 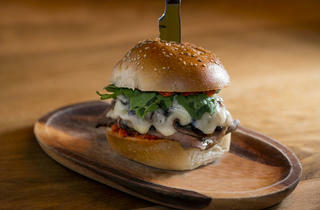 I like the fresh, airy, open space, the service has been great, and the food is simple and delicious. Out of everything I've tried, I've narrowed my favorites down to two- The Linguine with garlic and breadcrumbs, and the rigatoni with eggplant- I'm not entirely sure what it's called, but keep an eye out for it on the menu, or ask your waiter- The sauce was so good! When I was there for lunch, I noticed some brunch-y items on the menu- Looking forward to going back to try the ricotta pancakes- They're served with bananas, walnuts, and NUTELLA- yum! 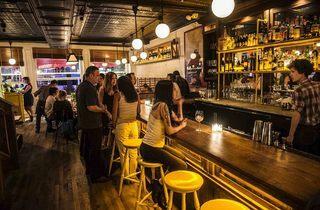 Bar Primi is a not-so-serious yet sophisticated spot inhabiting an unassuming street corner on the LES. It's the kind of place you can take almost anyone to and know that they'll find something they love the sound of - the menu is low-key but dishes are undeniably impressive. Fresh pasta and and a cocktail called frosé were what drew us here and neither disappointed. My plate of linguine with 4 garlic cloves and breadcrumbs was a lesson in the art of Italian cooking, a dish with likely 5 ingredients yet I'd be incapable of replicating it to the same standard at home. The prices are a little harder to swallow, particularly given the portioning, but that said each of left satisfied with shared starters and a primi each and if I lived in New York I'd definitely be returning. Went here on a Thursday night with my roommate. I tried the infamous Frose (which I did not like so much) it was a bit bitter for me, but alas I had it. We had the rice balls as an appetizer and they were delicious and for the main course I had the ravioli which was also amazing. The prices are obviously outrageous but that's New York. The service was top notch and the food came out very quickly, it was certainly worth it and next paycheck I will be back! This place has gotten really popular after a Facebook video went viral featuring the restaurant's Frose cocktail (aka frozen Rose)... and rightfully so! Not only is the cocktail great, but so are the food, service, and ambiance. 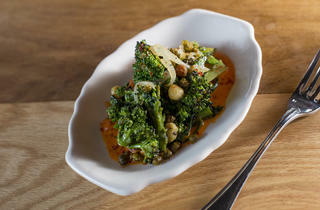 If you go for restaurant week, they include some great options on their 3-course menu. The burratta appetizer is delicious, as is the garganelli pasta dish. The gelato of the day when I went was hazelnut and it felt like I was eating a ferrero roche candy in ice cream form. Can't wait to go back to this place! One of the best places, and most affordable, places for a group dinner, especially for a girl's night out. 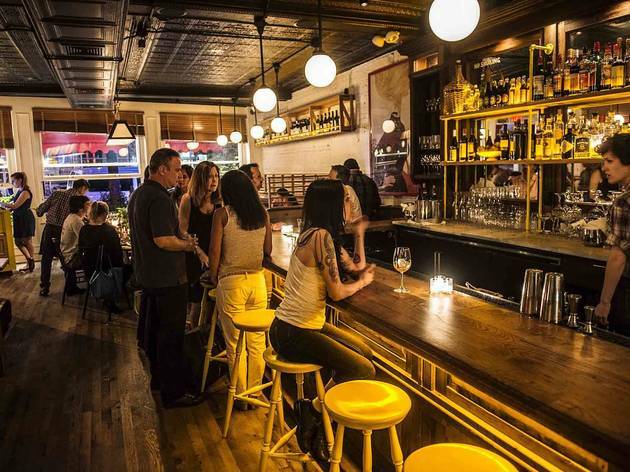 This place has everything you could want in a restaurant:great pastas; solid drinks including an extensive wine list; sidewalk seating; spacious interior; reasonable prices; ideal location; etc. The only reason I'm not giving it 5 stars is because it's not one of my all-time favorite places for Italian (and I'm picky with Italian) and I could use another pasta dish or two on the menu, but I've been here several times and always have an awesome meal. The romantic ambiance, delicious pasta selection and enjoyable craft cocktails make Bar Primi a solid option for good Italian food in a sea of options in New York. The entire menu is reasonably priced, with most pasta dishes and main courses coming in between $18-22 and cocktails falling at a standard $15ish range. 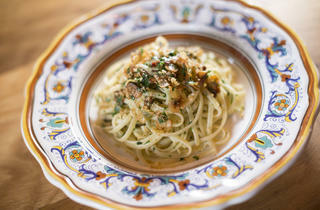 The Tomato Rice Balls and Spaghetti Pomadoro are my personal favorite dishes - fresh, delicious and authentic. Cocktail-wise, go for the seasonal strawberry frozen rosé - not listed on the menu but still available - which is the definitely the standout of the summer. Perfect for a date night, cocktails, or an evening out with a group of friends, the two-story restaurant has slightly slow service, but is a worthwhile haunt to find an enjoyable and authentic meal. I wish I could leave no stars for this restaurant. The food is mediocre and overpriced, absolutely nothing inventive or exciting. As well they have a huge customer service issue. My card was charged the wrong amount when I ate here a week and a half ago (by about $300). I realized the mistake and immediately contacted the restaurant and was told, after a ton of back and forth with an employee, that my card would be refunded. Over a week later the money has still not been refunded to my card. I have still yet to actually speak to a manager, as every time I call the manager is "not in" or "in a meeting". The manager also has all of my contact information, so could've reached out to me directly even if he really wasn't in, or in a meeting. I asked to receive proof that my card was refunded, and was never sent this. To sum it up - there a lot of other better Italian places in New York, but if you do decide to eat here I would definitely check your statement, as this restaurant is apparently very careless with credit cards. 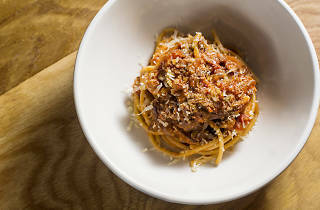 The pastas at sleek newcomer Bar Primi are exceptional, particularly the linguine, packed with garlic and breadcrumbs, and the kind of pasta dish you dream about all the time, and the spaghetti and clams, deepened and spiced with a hit of ‘nduja. 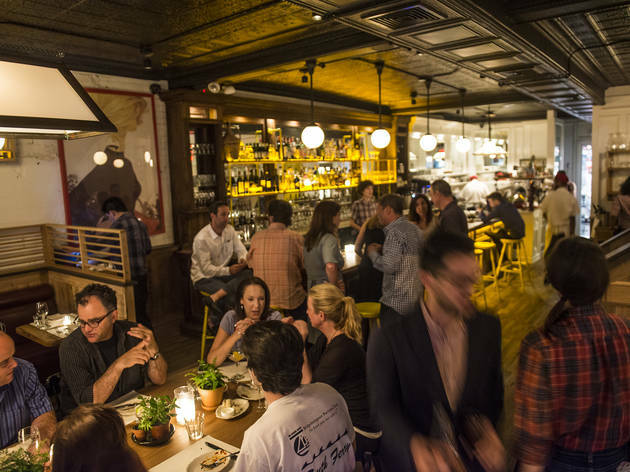 The two-level space definitely gets crowded, so a reservation is a good idea—though you can always while away time with the suits at the bar downstairs. 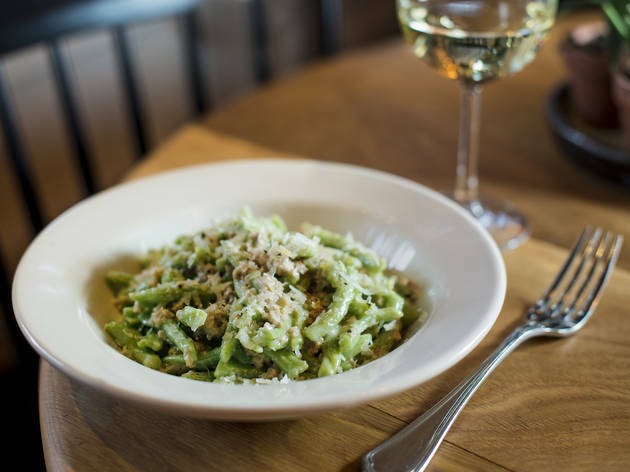 Pasta is the thing here, though you can round out your meal with salads and small plates, though they don’t reach quite the same level as the masterful noodles in each dish. 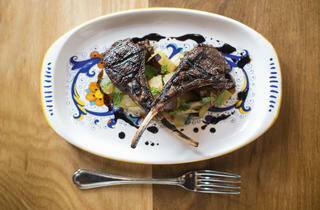 There are so many great Italian restaurants in New York, but Bar Primi is definitely my favorite. They have a wide range of choices both in food and cocktails are extensive and surprisingly cheap for how good everything is. They don't take reservations for parties under five but the last time I ate there the manager came to our table and after telling him the restaurant was one of my favorite restaurants he gave us his direct number to call if we ever had to wait too long to get a table. My personal favorites are the Sicilian Tomato Rice Balls, Spaghetti Pomadoro, and for a refreshing summer drink I love the Italian Iced Tea.